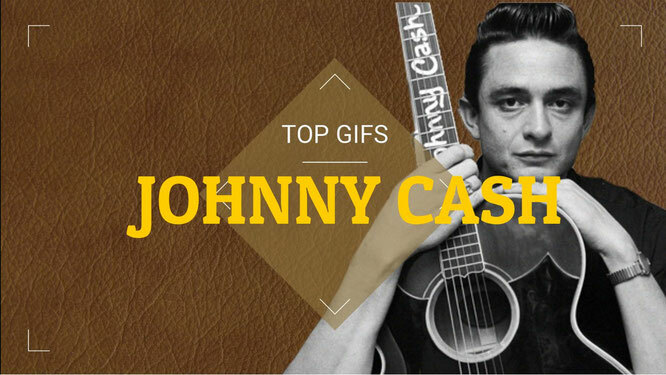 Johnny Cash´s Top Funny GIFs! - Newhillbilly website. 100% American Roots Music. John R. Cash (born J. R. Cash; February 26, 1932 – September 12, 2003) was an American singer-songwriter, guitarist, actor, and author. [ He is one of the best-selling music artists of all time, having sold more than 90 million records worldwide. Although primarily remembered as a country music icon, his genre-spanning songs and sound embraced rock and roll, rockabilly, blues, folk, and gospel. This crossover appeal won Cash the rare honor of being inducted into the Country Music, Rock and Roll, and Gospel Music Halls of Fame. Cash was known for his deep, calm bass-baritone voice; the distinctive sound of his Tennessee Three backing band, which is characterized by train-sound guitar rhythms; a rebelliousness coupled with an increasingly somber and humble demeanor; free prison concerts; and a trademark, all-black stage wardrobe, which earned him the nickname "The Man in Black." He traditionally began his concerts by simply introducing himself, "Hello, I'm Johnny Cash," followed by his signature song "Folsom Prison Blues". Much of Cash's music contained themes of sorrow, moral tribulation, and redemption, especially in the later stages of his career. His other signature songs include "I Walk the Line", "Ring of Fire", "Get Rhythm", and "Man in Black". He also recorded humorous numbers like "One Piece at a Time" and "A Boy Named Sue"; a duet with his future wife, June Carter, called "Jackson" (followed by many further duets after their marriage); and railroad songs including "Hey, Porter", "Orange Blossom Special", and "Rock Island Line". During the last stage of his career, Cash covered songs by several late 20th-century rock artists, notably "Hurt" by Nine Inch Nails and "Personal Jesus" by Depeche Mode.